"Empire" actor Jussie Smollett has gone from victim to suspect after police said he staged a hate crime attack as a "publicity stunt" to "boost his career." WHAT DID SMOLLETT SAY HAPPENED THAT NIGHT? Jussie Smollett told Chicago police he was physically attacked by two men in downtown Chicago while out getting food from a Subway restaurant at 2 a.m. on Jan. 29. The black and openly gay actor told authorities the men used racial and homophobic slurs, wrapped a rope around his neck and poured an "unknown substance" on him. Police say Smollett told detectives that the attackers yelled he was in "MAGA country," an apparent reference to President Donald Trump's "Make America Great Again" campaign slogan that some critics of Trump have decried as racist and discriminatory. Chicago Police Supt. Eddie Johnson said Smollett sent a threatening letter to himself and then paid two men $3,500 to stage the attack against him. Police say phone records show Smollett called the two brothers he commissioned to orchestrate the attack "quite a bit before the incident." The three spoke "at least an hour or so before the attack, an or so after the attack and then while they were out of the country," Johnson said. The staged scene did happen at the location Smollett reported to police, authorities said. The brothers were wearing gloves during the attack, but police say scratches and bruising seen on Smollett's face following the incident were "most likely self-inflicted." Prosecutors alleged in court Thursday that Smollett also paid the brothers $100 for supplies in the attack and drove them to the location ahead of time to show them where he wanted to be attacked. Prosecutors said one of the brothers also provided "designer drugs," including mollie, to Smollett. Police said Smollett orchestrated the "stunt" to "boost his career." "This stunt was orchestrated by Smollett because he was dissatisfied with his salary. So he concocted a story about being attacked," Johnson said Thursday. HOW DID POLICE FIND OUT? Read a full timeline of how police say the case unraveled. "This case in particular involved hours of video evidence, which when combined with old-fashioned police work, uncovered the truth," Johnson said. "These detectives deserve all the credit in the world for carefully analyzing the leads and the evidence for weeks before coming to their conclusion. I'd also like to thank the FBI for their help in this investigation. The FBI's partnership with CPD has been pivotal in this particular case. I only hope that the truth about what happened receives the same amount of attention that the hoax did." Police said they used video to track two "persons of interest" from the scene. The video showed the men getting into a cab, which investigators located before speaking to the cab driver and obtaining video from the vehicle. Police followed the cab on video until the men got out. Police said they were able to track the men backwards to where they came from. Police said they followed up on a ride share the pair had used and were able to identify the men, who they discovered had taken a flight to Nigeria. Police waited for them to return from Nigeria and take them into custody. Through their interviews with the men, their investigation quickly shifted. "At that time that this investigation started to spin in a completely new direction," said Commander Edward Wodnicki. 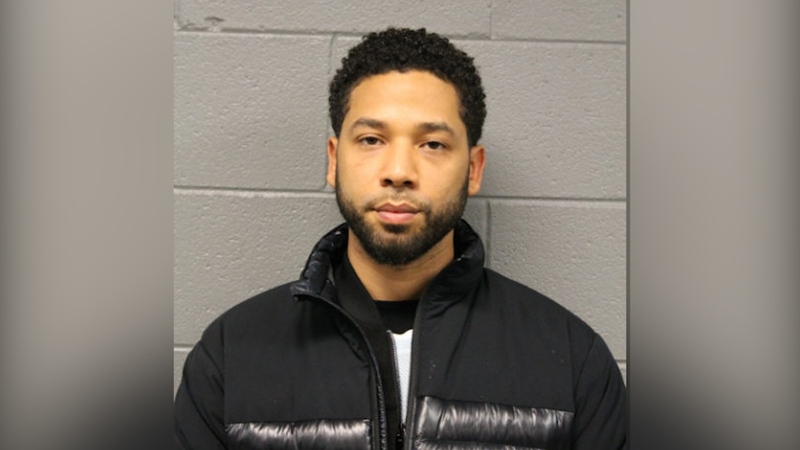 Smollett turned himself into police early Thursday morning on a felony charge of disorderly conduct in filing a false police report. His bail was set at $100,000 with pretrial monitoring. The "Empire" star was charged Wednesday with the class four felony, which carries a sentence ranging from probation to up to three years in prison, according to Chicago police and the Cook County state’s attorney’s office. "Like any other citizen, Mr. Smollett enjoys the presumption of innocence, particularly when there has been an investigation like this one where information, both true and false, has been repeatedly leaked," Smollett's legal team said in a statement Wednesday. "Given these circumstances, we intend to conduct a thorough investigation and to mount an aggressive defense." Smollett will appear in bond court Thursday afternoon. Chicago Police Supt. Eddie Johnson said he hopes to see an apology from the actor. "Absolute justice would be an apology to this city that he smeared," Johnson said. "Admitting what he did and then be man enough to offer what he should offer up in terms of all the resources that we put into this." As for his role on "Empire," it appears that remains to be seen. "This morning, I come to you not only as the superintendent of the Chicago Police Department, but also as a black man who spent his entire life living in the city of Chicago. I know the racial divide that exists here. I know how hard it's been for our city and for our nation to come together. And I also know the disparities, and I know the history. This announcement today recognizes that "Empire" actor Jussie Smollett took advantage of the pain and anger of racism to promote his career. I'm left hanging my head and asking why. Why would anyone -- especially an African-American man -- use the symbolism of a noose to make false accusations? How could look at the hatred and suffering associated with that symbol and see an opportunity to manipulate that symbol to further his own public profile? How can an individual who has been embraced by the city of Chicago turn around and slap everyone in this city in the face by making these false claims? Bogus police reports cause real harm. They do harm to every legitimate victim who's in need of support by police and investigators, as well as the citizens of this city. Chicago hosts one of the largest pride parades in the world, and we're proud of that as a police department and also as a city. We do not, nor will we ever, tolerate hate in our city, whether that hate is based on an individual's sexual orientation, race or anything else. I'm offended by what's happened, and I'm also angry. I love the city of Chicago and the Chicago Police Department, [works] and all, but this publicity stunt was a scar that Chicago didn't earn, and certainly didn't deserve. To make things worse, the accusations within this phony attack received national attention for weeks. Celebrities, news commentators, and even presidential candidates weighed in on something that was choreographed by an actor. First, Smollett attempted to gain attention by sending a false letter that relied on racial, homophobic and political language. When that didn't work, Smollett paid $3,500 to stage this attack and drag Chicago's reputation through the mud in the process. And why? This stunt was orchestrated by Smollett because he was dissatisfied with his salary. So he concocted a story about being attacked. Now our city has problems, we know that. We have problems that have affected people from all walks of life, and we know that. But to put the national spotlight on Chicago for something that is both egregious and untrue is simply shameful." "@JussieSmollett - what about MAGA and the tens of millions of people you insulted with your racist and dangerous comments!? #MAGA"
"I want to thank all of the Chicago police officers who have worked on this case, and all of the private citizens and business owners who have stepped forward with information and video evidence to help us get to the bottom of what was reported as a hate crime. All across Chicago, in every neighborhood, there are signs in front yards and in windows that read, "Hate Has No Home Here." It is a sign that expresses our shared values and defines our great city. Chicago's message to the world is that no matter where you come from, who you love, or how you pray you will always have a home here. Our laws exist to reflect and defend those values, and hate crimes will never be tolerated. A single individual who put their perceived self-interest ahead of these shared principles will never trump Chicago's collective spirit."